There are few SEMA projects that have made an impression on us as much as Classic Design Concepts’ 1967 Flashback Mustang. The stunning fastback debuted in Las Vegas in 2007, taking home Ford’s Best of Show and Outstanding Achievement in Design. Starting with a Dynacorn steel body, CDC stuffed the car with modern tech like a Shelby GT500′s supercharged 5.4-liter V8, Tremec 6-speed transmission, custom four-link rear suspension, 9-inch rear end, Wilwood brakes and more. The interior is just as impressive, featuring a vintage look combined with modern conveniences like a Rockford Fosgate sound system and Vintage Air climate system. So why are we bringing up the Flashback Mustang now? Well, the car’s now for sale. RK Motors of Charlotte, NC has put the car up on eBay with an asking price of just under $110,000 – you can see the full listing here. While you might not be able to afford the car, you can always check out the beautiful photos below. 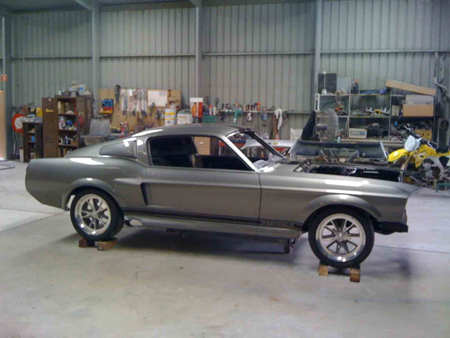 This entry was written by by MustangsDaily (Mustangs Daily) and posted here on Thursday, January 31st, 2013 at 4:41 pm and is filed under 1967 flashback mustang, 1967 mustang, Classic Design Concepts, classic design concepts flashback mustang, flashback mustang, For Sale. This article was not written by us, rather gathered using RSS feeds listed here. We take no credit for this article. You can leave a response, or trackback from your own site.